The sixth entry in the franchise recorded the series' best opening ever. 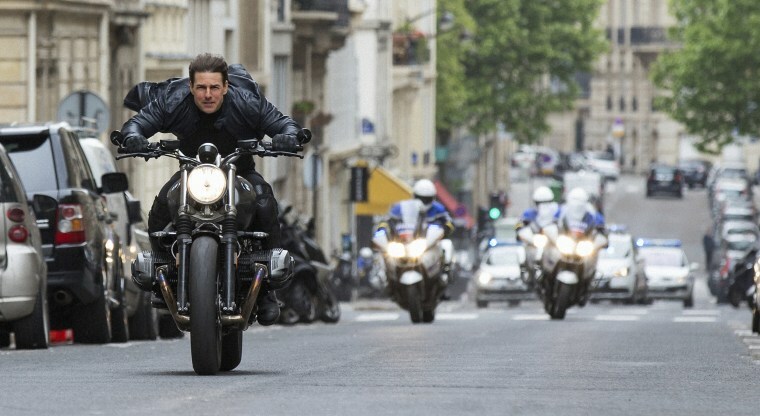 LOS ANGELES — After six movies, 22 years, countless bruises and a broken ankle, Tom Cruise's death-defying "Mission: Impossible" stunts continue to pay off at the box office. "Mission: Impossible — Fallout" easily took the No. 1 spot on the domestic charts over the weekend. Paramount Pictures estimates that it earned $61.5 million from 4,386 North American theaters. Not accounting for inflation, it's a best for the long-running franchise, which has grossed $2.8 billion worldwide, and one of Cruise's biggest, too (just shy of the $64.9 million debut for "War of the Worlds" in 2005). Internationally, the film earned $92 million from 36 markets, which is also a franchise best. Directed by Christopher McQuarrie, "Fallout" has scored some of the best reviews in the series and has been in the news cycle for almost a year. Talk about the film started early, in August 2017, when Cruise broke his ankle performing a stunt in London with video to prove it. "Paramount was strategically perfect in their marketing and publicity game," said Paul Dergarabedian, senior media analyst for comScore. "They showed how important a star's presence is in marketing the movie early on. Tom Cruise broke his ankle, and they made that into a positive for the movie — it fed the Tom Cruise 'Mission: Impossible' mystique." Second place went to "Mamma Mia! Here We Go Again," which fell by 57 percent in its second weekend in theaters, to earn $15 million. It was a much steeper decline than was recorded for the first film, which dropped by only 36 percent between its first and second weekends. Denzel Washington's "The Equalizer 2" slid to third, with $14 million in weekend two, and "Hotel Transylvania 3: Summer Vacation" took fourth, with $12.3 million. The animated "Teen Titans Go! To the Movies," a feature spinoff of the Cartoon Network television show about Robin and some of the lesser-known DC superheroes, was the only major film to open against "Fallout." The Warner Bros. release earned $10.5 million and landed in fifth place. The film earned positive reviews from critics and younger audiences, but it also faced a fair amount of animated competition from both "Hotel Transylvania 3" and "Incredibles 2," which is still going strong in its seventh weekend and headed toward the $1 billion mark. As of Sunday, the Disney/Pixar sequel had earned an estimated $996.5 million worldwide. But although $10.5 million might seem on the lower side, "Teen Titans" also cost only $10 million to produce. "Family movies like this will play for a lot of weeks," said Jeff Goldstein, president of domestic distribution for Warner Bros. "The whole objective of this movie was to work with our cousins in other Warner units for brand identification."